Pep Guardiola’s career was a highlight reel: with a few token disappointments that highlight reels must have in order to emphasise the glory. Johan Cruyff, the inventor Total Football, shouted from the figurative roofs that his protege, Guardiola, is the most intelligent midfielder in Europe. His trophy haul reads 6 LaLigas, 4 Supercopas, one each of Copa Del Rey, European Cup, European Super Cup, UEFA Cup Winners Cup. He was the trebuchet that formed the base of the attack. Pep Guardiola had the drive-in-cinema vista of watching some of the greatest Barcelona team tactically unfold in front of him like a red carpet. It was cause for little surprise when Pep glided his way up from La Masia youth management to the hot seat of managing some of the greatest players to play football. The crowning glory of Mauricio Pochettino’s playing career as an above-average centre-back came at Espanyol with two Copa Del Rey titles. He then pinballed between France and Spain until obscurity cast its itchy burlap sack. Few across the English channel knew nor cared when Pochettino retired. In fact, a Google search to check out the name of Mauricio Pochettino’s biography yielded no result apart from a sponsored advert on the right with a link to buy Pep Guardiola’s biography: Pep Confidential. Even on the battlefield of e-commerce, it’s the story of Guardiola that unbiased algorithms prefer. And maybe rightly so, as manager Pochettino is yet to win a major trophy. The opening sequence of Pep: Confidential sees Guardiola embroiled in a chess with grandmaster Garry Kasparov. 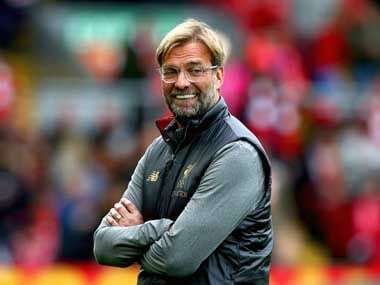 An obsessive collector of trophies, his managerial success is seen like the arcane and avant-garde, and mostly left to itself, unquestioningly, by the wider press. As if prodding for Pep’s magical methods would unveil their own footballing unintelligence and unravel conventional punditry as a showy display of twirling ribbons in the air. A deeper search into finding the name of Pochettino’s biography written by Guillem Balague reveals that it is called ‘Brave New World: Inside Pochettino’s Spurs.’ It alludes to an agricultural effort and lumberjack courage that an everyman requires, day in day out, to become a self-made man. The title would be an accurate description of the toil and toll it took for Pochettino and Tottenham to be where they are. “Pep and I played a lot of games against each other in LaLiga, I was at Espanyol and Guardiola was at Barcelona, and he knows we’re brave, that we like to go forward, be protagonists,” appraised Pochettino in the pre-match presser. Pochettino the protagonist has modeled Spurs in his own image. This Tottenham team had to be their own heroes. Pochettino has spent a total of £166 million on transfers in the last three seasons, as opposed to City’s £517.4 million (figures provided by Transfermarkt.de). While it was expected of Manchester City to be in the quarterfinals of the Champions League, Tottenham had to embody the toughened bootstrap spirit of a hitchhiking John Kerouac (the author of On The Road) to be there. Regardless as to what the balance books read, a fair Pochettino enthuses that Manchester City’s collective is more than the sum of its parts. “Manchester City’s primary strength is not simply their talent. It’s also in their determination to fight for every single ball. 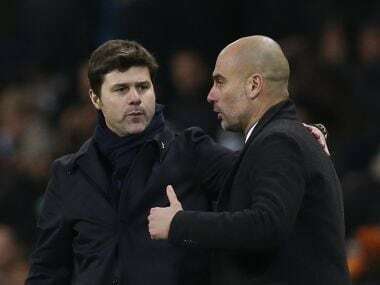 De Bruyne, David Silva, Bernardo Silva, Sterling, Jesus, Agüero – before they start to play, they know they have to earn their right to by winning the ball first,” noted Pochettino. Quite notably, Manchester City’s graceful-yet-effective samurai executioner style has been in stark contrast to Liverpool’s ride-the-luck football. They press in numbers and with a degree of choreographed control: like the famous ‘rain of arrows’ routine, launched from the bows of backtracking Mongol hordes, followed by a turn-of-the-hooves-onslaught. Fernandinho’s sense of timing in the tackle dictates the rate of counter attacks – he’s City’s metronome and general Kublai Khan. Pochettino’s managerial mantra as revealed in Brave New World is: "Be brave in all endeavours whilst playing, from assertive tackling to daring passing, powerful forward runs and a certain composure on the ball whilst under pressure.” – Agitating City’s rhythm into anxiety starts with employing two mobile playmakers on Fernandinho. This sets the stage for Pochettino's strengths, the tendency to repeatedly pick an ultra-attacking 4-2-3-1 that takes the shape of 3-5-1 in attack, in the defiant of fixtures. The good fortune of having versatile defenders allows Tottenham to hold a high-line and leave three in the back while their attacking full-backs double-up with their central creative midfielders to expose Manchester City’s wide areas. Pochettino is aware of the size of the task: “We as a team need to make sure we match City’s pressure off the ball. We want to start tough, be aggressive, dominate.” It’ll be like two opposing orchestra trying to outdo each other's tempo. It will be one of those nights where the lines between the supporters in the stand and the performer blur in spirit – when both want it as bad as the other. Manchester City players have tried to coyly downplay the knock-on effect Tottenham’s new 62,000-seater, the state-of-the-art stadium may have. Manchester City weren’t ready for the tidal wave of sounds coming down the slopes of Anfield last season. Caught marooned and breathless, City floated around like inflatable doughnuts at sea, following tides after tides of Liverpool attack. Manchester City fell 3-1 behind in half-an-hour. The predominant tactical question veteran football writer Jonathan Wilson asks in his pre-match report is: “How hard do Tottenham press?” How hard can Tottenham press without dismantling themselves into sputtering cogs and gears? Manchester City conditioned structure is not pliable as playdough, neither is their mentality. A cosmic flaw in Tottenham’s horoscope could explain the number of times the team has fumbled the initiative to assert their credentials as one of Europe’s finest. Wilson poetically calls this quality “Spurriness.” Tottenham tend to reach peak crisis of existence in the most defining moment. Their servile compliance to the underdog narrative might be their undoing. “For us, the win will be a massive bonus,” concedes Pochettino. 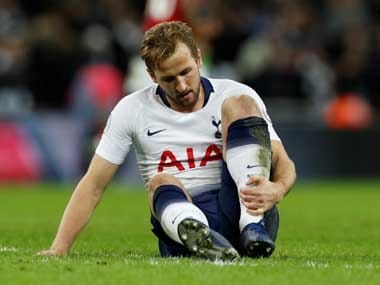 Until Tottenham fully believe that they earned their right and then some, will they be able to come out of their own heads? Maybe the crowd present tonight at Tottenham's home ground can give their heads a wobble?